I've been following a few simple skin care rules and it seems to be paying off; my skin is super happy. A huge reason my skin is so happy lately is down to the products I've been using. I've consciously built a minimal skin care routine by sticking with what I know works and only introducing new products slowly, one at a time. I've ditched the wish list full of products I don't need and made wearing no make-up (or lightweight alternatives) a regular occurrence. I've also made sure to remove my make-up as soon as I possibly can; no more waiting until midnight to cleanse means my skin can reap the benefits of a few extra hours to soak in treatments. While I don't particularly like the Mario Badescu Cucumber Make-Up Remover Cream my skin seriously loves it. This cold cream is thick, greasy, and heavy on the skin yet it's absolutely perfect in every way, all trace of make-up is lifted and removed; followed by the shimmery pastel green Mario Badescu Enzyme Cleansing Gel, which smells fresh and leaves the skin wickedly soft. These two are my dream team right now. I've been alternating between the La Roche-Posay Effaclar Duo and the Vichy Idealia Life Serum (with a heavy bias towards the serum). While Effaclar Duo works to prevent break-outs, blemishes, and to keep pores clean, the Vichy Life Serum helps to repair environmental damage and restore an overstressed, overexposed, and unbalanced complexion. Since using these two my skin has been literally spotless and noticeably more radiant. I wish Effaclar Duo worked for me but it just didn't but I like the sound of that serum! I am loving the Clarins Lotus Face Treatment Oil right now. The Cucumber Makeup Remover sounds awesome! Except, I could totally understand your despise if you don't like cucumber scents. 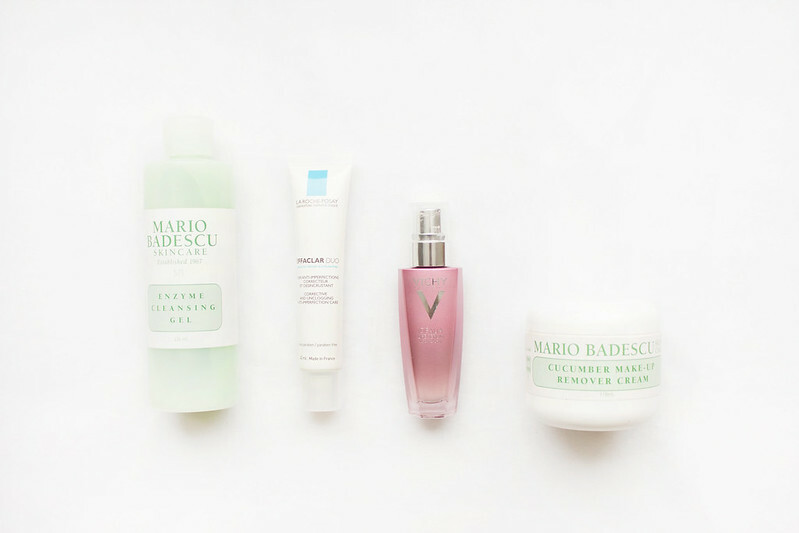 I need some Mario Badescu products in my life! It's weird that Effaclar Duo works for so many people. It broke me out something awful and totally dried my skin.